United Fresh Produce Show Exhibit Planned by Symbology, Inc.
Symbology, Inc. will exhibit their PTI (Produce Traceability Initiative) Solutions at the upcoming United Fresh Produce show in Dallas, TX. Expo dates are May 1 - 3, 2012. Symbology, Inc. plans to exhibit PTI (Produce Traceability Initiative) Solutions at the upcoming United Fresh Produce Show May 1 – 3 in Dallas. Symbology anticipates significant interest in their offerings as traceability continues to be a concern and major focus for the produce industry. The PTI – or Produce Traceability Initiative is an industry wide effort to improve traceability throughout the supply chain…from farm to store. Sponsored by three prime produce organizations including United Fresh Produce Association (United Fresh), Canadian Produce Marketing Association (CPMA) and Produce Marketing Association (PMA); the group recommends a standardized approach for electronic traceability at the case-level in 2012. 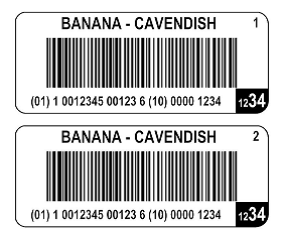 Plans are developed in cooperation with GS1 US – the center for barcode standards. As a provider of traceability solutions for many produce applications, Symbology helps clients evaluate their existing systems and determine which solution will be the most economical and efficient for their particular situation. Additionally, Symbology has created customized application tools that better function with unique aspects of some case labels. PTI calls for a machine readable barcode in three places: Case identification; Pallet identification; and Count-of-item (case) identification. PTI options include pre-printed labels, print on demand labels, and direct print on cases. Each user’s circumstance should be evaluated to determine which solutions fit with current systems, as well as which can provide additional benefits beyond fulfillment of PTI requirements. Attendees will find Symbology, Inc. in booth #12214 in the expo’s featured traceability area. Check Symbology’s web site for further PTI information http://www.symbology.com. Or contact Client Services at 800.328.2612 x 0, clientservices(at)symbology(dot)com. Symbology, Inc., established in 1980, is a specialty manufacturer of sequentially numbered barcode labels, featuring custom and standardized industry-specific label products for library, blood, tire, fresh produce, medical, and material handling. In addition, they are a leading provider of digital barcode files including the GS1 DataBar coupon code. An ISO 9001:2008 certified company; they also offer a complete line of inspection / verification equipment. Customers around the globe choose Symbology for high quality products, technological expertise, and unsurpassed customer service. Offices are located in Maple Grove, Minnesota. Web address: http://www.symbology.com.